The Alize Grenelle Tour Eiffel is a charming 3-star hotel located a 15-minute walk from the Eiffel Tower. This quaint Parisian hotel is also close to the Porte de Versailles’s exhibition centre making it an ideal base for business and leisure travellers. After a long day’s work or sightseeing our guests can enjoy a relaxing break and sip a cup of tea or coffee in our colourful lounge where a large sofa and club armchairs awaits them. Enjoy the wonderful Beaugrenelle Commercial Center, its shops, restaurants and cinema, located just 2 minutes walk from the hotel. Reserve your secure parking place in advance (20 EUR / day). Alizé Grenelle Tour Eiffel Hotel offers you 50 charming rooms, all with air conditioning and double glazing for a sound nights sleep. The en suite bathrooms are modern and comfortable, and fitted with shower or bathtub, toilet, hairdryer and toiletries. The rooms come well-equipped with satellite TV, desk, direct dial phone, safety deposit box, alarm clock, trouser press and free WiFi. The reception is open 24/7. Our friendly staff will be happy to assist you with booking a taxi, a restaurant or a show. They can also organise your car or bike rental and give you advice on what to see and where to eat out during your stay. 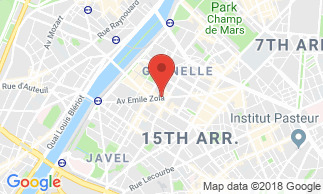 The Alizé Grenelle Tour Eiffel Hotel enjoys a prime location just a short walk from the world famous Eiffel Tower and a direct metro ride from the bustling Saint-Germain or Latin districts in Paris. Guests will enjoy this typically Parisian area with its small shops, good bakeries and large choice of restaurants and cafes all within walking distance from the hotel. Enjoy the wonderful Beaugrenelle Commercial Center, its shops, restaurants and cinemas, just 2 minutes walk from the hotel. Breakfast is not included in the room rate : 12 EUR per person.